Insect Doctor 2 USA Edition is an insect hunter style arcade game, where players must use the gun to shoot at butterflies, spiders, centipedes and other insects to gain points. The game features special items that float in the field, and when hit, release special powers. Insect Doctor 2 USA Edition also features special insects like the special worm, lucky insect and royal hornet with give the player multiple bonus rewards or higher points when hit. Special Items include: <b> The Flame Moth </b> - Sprinkles powder to bomb all normal insects on the field. <b> Neuronic Goliathus</b> - Releases lightning to attack all normal insects continuously. <b> Black Widow </b> - Uses silk to sniper insects on the field. <b> Dead Leaf </b> - If players find the correct dead leaf, they receive an award. <b> Blasting Centipede </b> - If players defeat it, its body will turn into a bomb and explode. <b> Lucky Insect </b> - If caught, players receive a x2 to x10 bonus reward. <b> Magical Candy Bag </b> - Shooting it will increase its rewards. If players can defeat the magical candy bag, it will stick to all normal insects on the field. These insects will provide double rewards. <b> Royal Hornet </b> - Random upgrade reward. <b> Morra Apple </b> - Players must catch the insect with the Morra symbol to start the Morra mini game with a magical apple. If you win, the reward will double up. Players can gain more rewards with each win. Insect Doctor 2 USA Edition is an insect hunter style arcade game, where players must use the gun to shoot at butterflies, spiders, centipedes and other insects to gain points. The game features special items that float in the field, and when hit, release special powers. 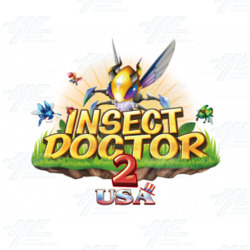 Insect Doctor 2 USA Edition also features special insects like the special worm, lucky insect and royal hornet with give the player multiple bonus rewards or higher points when hit. The Flame Moth - Sprinkles powder to bomb all normal insects on the field. Neuronic Goliathus - Releases lightning to attack all normal insects continuously. Black Widow - Uses silk to sniper insects on the field. Dead Leaf - If players find the correct dead leaf, they receive an award. Blasting Centipede - If players defeat it, its body will turn into a bomb and explode. Lucky Insect - If caught, players receive a x2 to x10 bonus reward. Magical Candy Bag - Shooting it will increase its rewards. If players can defeat the magical candy bag, it will stick to all normal insects on the field. These insects will provide double rewards. Royal Hornet - Random upgrade reward. Morra Apple - Players must catch the insect with the Morra symbol to start the Morra mini game with a magical apple. If you win, the reward will double up. Players can gain more rewards with each win.